Christmas and chocolates seem to go hand-in-hand — mint chocolate truffles, salted caramel, dipped pretzels, peppermint bark, and you simply can’t forget hot cocoa. Chocolate is a staple of the holiday diet. It seems only natural that chocolate appear on your gift-giving list this year, whether in the form of a sweet stocking stuffer, a crowd-pleasing neighbor gift, or even as a treat on your own family’s dessert table. Making your own chocolates shows how much you really care. 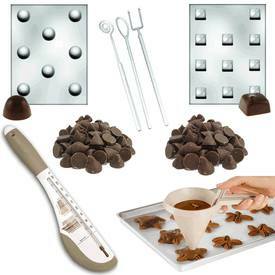 Make some chocoholic dreams come true this Holiday with our Chocolate Tempering Candy Making packs! Our holiday packs make a great gift for any candy making hobbyist, or buy one for yourself to get started making homemade chocolates this year! Our candy making packs include: Milk chocolate, Dark chocolate, EZ Pour Chocolate Funnel, Square Chocolate Mold, Round (Bon Bon) Chocolate Mold & 3pc Dipping Tool set (Mini Rev pack also available with a tempering machine! ).